A special punch set for cutting small, precise holes in soft materials where throated or plier punches won't reach. Set has a round handle with slot inside to clear punchings. Handle is threaded to accommodate the seven replaceable screw tubes. 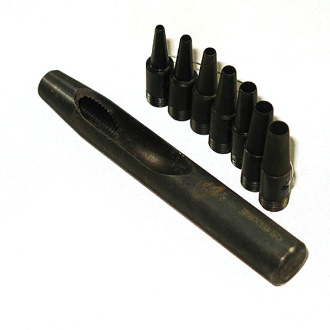 Set consists of seven tubes and handle.Tube size No. 0 1 2 3 4 5 6 Tube size (in) 5/64 3/32 7/64 1/8 5/32 11/64 3/16 Sets is carded for display purposes. Replacement tubes are also sold individually.